Ayn Kraven’s oversized canvases are full of life, color and energy – dynamic compositions that demand the viewer’s full attention. 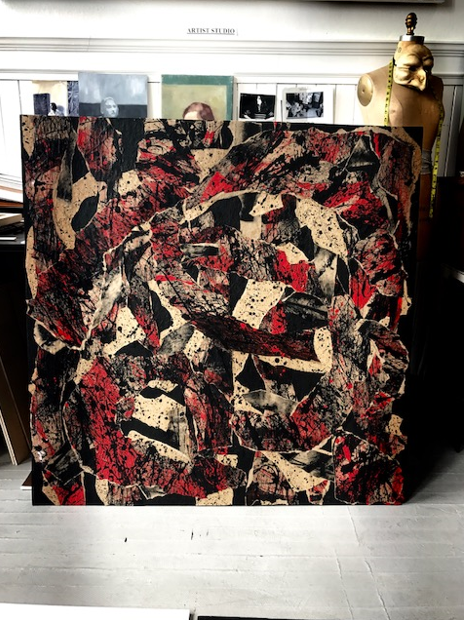 Working primarily in acrylics, oils, and mixed media, Kraven is an accomplished abstract artist with a robust, devoted following on her Instagram account, @AynKraven. What we really admire about Ayn’s work is her fearless devotion to process. Emotionally intense, her explorations command contemplation: it is a pleasure to regard the finished work whilst discerning the route Kraven on her journey of creation. She states that every stroke matters. We see this manifesting in the rich array of texture and dimensionality that makes her work so arresting. Ayn has traveled and trained in many places throughout her life. “In the end, you are the creation of your own experiences,” she explained, crediting a turbulent childhood, artistic training in Switzerland, London, and Parson’s School of Design as critical points in her artistic development.